For HUGE discounts, see special offers above! Don't spend $200 at a spa for the same treatment you can get at home. Our natural microdermabrasion exfoliating scrub & facial mask will give you a glowing, beautiful complexion at a fraction of the price. We produced the highest quality natural sugar scrub you'll find anywhere. Natural, organic ingredients include Aloe Vera - moisturizes the skin and boosts healing; Manuka honey - balances the skin's pH, detoxifies, stimulates healing and boosts the skin's immune system; Walnut - dislodges dirt and dead skin cells; Sugar Cane - helps the effectiveness of the walnut; Vitamin C - potent antioxidant that greatly reduces damaging free radicals and prevents premature aging. Cheaper treatments use primarily harsh shells which rip and damage skin, our facial exfoliator is the most gentle and effective way to remove dead skin, restore and heal for the most radiant look you'll ever get! Minimizes and cleanse pores, reduces fine lines and wrinkles on face, hands and body. Reduces acne and prevent breakouts while also treating embarrassing acne scars without the need for dangerous chemical peels. Acne scar removal doesn't have to be expensive or painful. This exfoliating anti aging mask is guaranteed to leave your skin smooth, increasing collagen production to restore and replenish your skin's youthful look. If you're looking for the best skin treatment, here it is. Get yours today and see a new you! THE BEST FACIAL SCRUB FOR DULL, DRY, SENSITIVE SKIN. Get Beautiful, more youthful skin or YOUR MONEY BACK! Remove stubborn blackheads, cleanse and minimize pores, exfoliate dull/dead skin cells and moisturize to the base of your skin with each wash. No machine needed. DON'T DAMAGE YOUR SKIN WITH HARSH SCRUBS- Most exfoliators tear and damage your skin. Our microdermabrasion sugar scrub gently loosens dirt, grime and dull skin while nourishing your cells- leaving healthy, beautiful skin. Get a softer, more youthful complexion in minutes. SAY GOODBYE TO DULL, DRY SKIN- Our natural face and body scrub removes daily build-up so your face can heal and look radiant again. Microdermabrasion at home saves money and helps gently polish away damaged skin, blackheads, stretch marks and a powerful acne scar treatment. Safer than chemical peel facials. MADE FOR SENSITIVE SKIN- Cruelty free, paraben free, alcohol free and non-toxic. 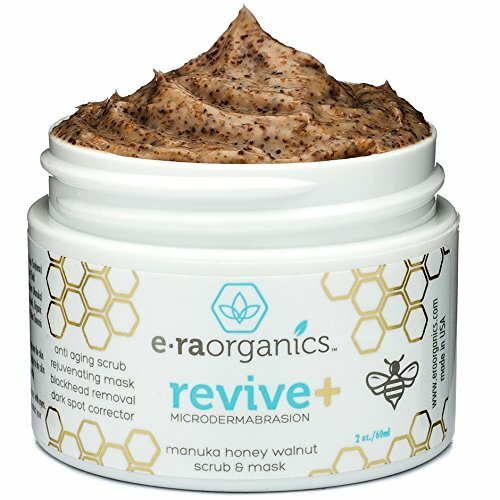 One of the highest quality organic skin care products containing organic Aloe Vera, Manuka Honey, Walnut and powerful Vitamin C to protect skin from damaging free radicals and premature aging in one simple exfoliating scrub and masks for face in one. If you have any questions about this product by Era Organics, contact us by completing and submitting the form below. If you are looking for a specif part number, please include it with your message.